Throughout history, there have been many impressive examples of youth leadership and engagement in volunteerism, activism, and politics. However, the majority of US youth are less engaged, and thus under-represented, compared to older adults in many of the civic and political institutions that regulate and coordinate public life. Adolescents and young adults both have the capacity and the motivation to be effective civic actors, but need opportunities and support to do so. Two strands of youth programming—Youth Led Organizing and Service learning—have emerged as effective models for supporting youth civic and political engagement and identity development. These approaches to civic education pair civic and political knowledge and skills development with opportunities to collaboratively define and work to address civic and political issues. As public life moves online, many questions emerge for the practice of civic education. New media tools and technology are quickly becoming the primary mechanism for bringing attention to issues of public concern, accessing information about civic and political issues, and connecting to and mobilizing constituencies. Furthermore, new rules and norms are emerging to address changes in how we think about issues of public concern such as access to and use of information, protection of privacy, norms of civility, etc. 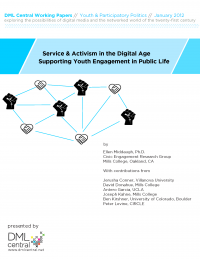 Civic educators must now not only consider how youth might use digital tools and practices in service of civic and political activity, but how online life is a context for civic and political activity.